The summers are fast approaching and with it our endless worries of keeping ourselves cool and comfy for those long hot nights. While having an AC or a cooler may seem like a quick fix to the blazing summers but they can also burn a big dent in your pockets. In the last few years, there have been some serious advancements in sleep tech that promises to not only keep us cool but regulate the body temperature. Not to mention, a serious reduction in your electricity bills as well. Cooling comforters are the new game changers that promises that you get sound sleep with extra comfort. Today there are an assortment of comforters on the market that are made from different moisture wicking materials like bamboo, cotton, and linen. Their heat regulating properties are essential in keeping your body cool. 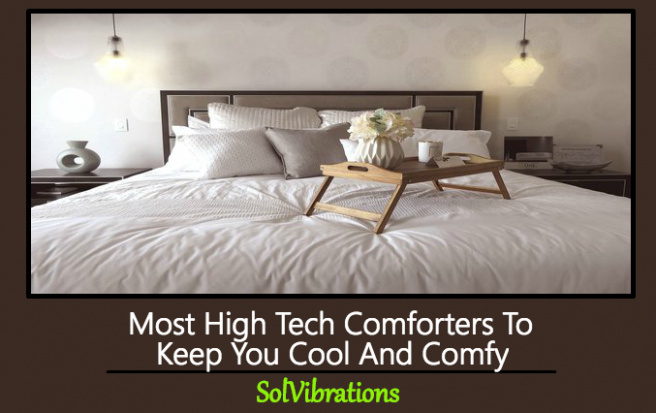 In this post, we look at some of the most high tech comforters doing their rounds in the market. The Bedjet Air Comforter is made of 100% fiber and has internal cavities spaced out evenly to enhance proper airflow. Also regarded as the first powered cooling and warming sheet for bed, the Bedjet Air Comforter is one of the best options available on the market today. The comforter can immediately improve the overall distribution of coolness throughout the entire surface and can, therefore, be used on both sides of the bed to help with proper cooling. The EvenTemp Temperature Balancing Comforter is a cool 300-count cotton sateen comforter that can wick away moisture and instantly get you cool. Once your body gets cool enough, the wicking technology in the comforter takes away the moisture at a relatively slower pace so that you stay at an ideal temperature. The whole comforter comes in a box quilt design that also comes with a fiberfill that ensures the weight stays evenly around without much movement. Customers also get different size options to choose from here with EvenTemp Comforters. If you are looking for the finest cotton in the market, then the Pacific Coast: European Down Comforter made should definitely be on your list. Carved from Egyptian cotton and made with a down and feather filling, the texture and finish of this comforter is hands-on smooth, fluffy and extremely comfortable. The fabric woven inside of the comforter prevents it from leaking out and you won’t ever have a chance of being rudely woken by an unexpected quill sticking out of it. Its remarkable breathable quality will allow you a sound sleep during summers and the comforter itself can last for up to 10 years. The Hypoallergenic Comforter comes with a rich satin trim detail that makes it soft and extremely gentle during contact and unlike other comforters, this is accustomed to regular washes. The fabric has a 1-inch satin trim detail with a high-quality duck down feeling that is capable of retaining its original structure without the chance of getting ruined. The comforter works best with DOWNLITE bedding. If you are checking out some accessories for your home, you can try utilizing a voucher for Laura Ashley which can fulfill your need within a budget. Well, no one has ever said no to linen ever and Sofia’s Linen 100% Pure Flax Linen is no exception either. This comforter is just the right balance of comfort and coziness to get you through those sweltering hot nights without breaking a sweat. Being hygroscopic in nature, the comforter can absorb moisture and remains cool all the time. With additional thermo-regulating capabilities, you can be sure that it will stay cool during the entire summer. Washing the comforter will also not affect its quality as the fabric will only get softer with each wash. So there we have the best high tech comforters to keep you cool and comfy. Make sure to check all these options for your next comforter at home. This Concludes: Most High Tech Comforters To Keep You Cool And Comfy. What Did You Think Of This Post? Please Let Us Know By Rating Below!